Pictured above is Bob and Mo May’s Bongo and boat ‘Boy Adam’ taken at Watermouth Cove, near Ilfracombe. 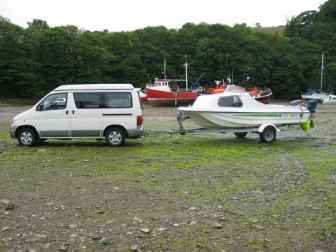 “Bob and I took our newly acquired N-reg Bongo on holiday to Watermouth Cove, near Ilfracombe, North Devon, a few weeks ago. We have been camping for about 50 years, and this was our first experience of sleeping in a vehicle instead of a tent. We assumed it would be much easier, but I’m not sure about that now! Instead of just unzipping the bedroom compartment of the tent and collapsing on to the already-inflated airbed, we had to (a) put up the privacy screens (b) lay the seats flat (or as flat as is possible with a Bongo! ), (c) crawl over the seats to lay out the mattresses, sleeping bags and pillows. By which time I felt too exhausted to undress and usually slept semi-clothed. We only bought the Bongo a couple of months ago and have not yet got around to any conversion, which we do intend to look at next year, and perhaps this will help. We are coming to the Bongo Fest South West and hope to pick up some tips from seasoned Bongliers on sleeping arrangements, kitchen conversions and awnings (we really do need one as our tent is not high enough to stand up in). Anyway, we had a wonderful time at Watermouth Cove. We stayed at Big Meadow camping site, which I can recommend. Very clean and well laid out, excellent toilet and shower block, laundry room, small shop, games room, very friendly proprietors, only £6.50 a night. Just about 10 minutes by car or bus into Ilfracombe, and only 10 minutes walk to Watermouth Cove harbour. We took our boat and did a lot of fishing in the little bays along the coast. The camp site does have its own private beach but it is 220 steps down a sheer cliff face, and I got one-third of the way down and chickened out! I took my Bongo Fury ‘calling cards’ and managed to Bongo 3 people, don’t know whether they will become members though. Three tips I would like to pass on – not for seasoned Bongoliers or campers of any sort, but new recruits might find them handy. Firstly, buy a toasted sandwich maker (only £5 odd in Asda), you can very easily make a delicious meal with the addition of some salad, and no messy pots to wash up. Secondly, take a crate for washing up. Carry your dirty dishes to the washing-up facilities in this, as you wash your dishes stack them in the crate, they drain dry very quickly and stop teatowels from getting sodden. And thirdly, take a few solar lights from your garden. Stand them outside the Bongo or awning during the day, then at night you can light up your site with them.